Pumpkin carving is a lot more work than I remembered. I haven’t done a real Halloween pumpkin carving in the US for a long time. I have memories of late autumn afternoons at my Grandpa’s house, carving my masterpiece on the face of the (slightly lopsided) orange monster that I picked out of hundreds at the pumpkin patch. Drinking hot cider, jumping in recently raked leaf piles, plotting the perfect costume. When it got dark, seeing your pumpkin all lit up was magical. I’m sure the memories are heavily filtered – late October in MN is cold at best, and I do remember breaking out in an allergic rash from the leaf pile one year. But it is still a tradition from my childhood that I miss. 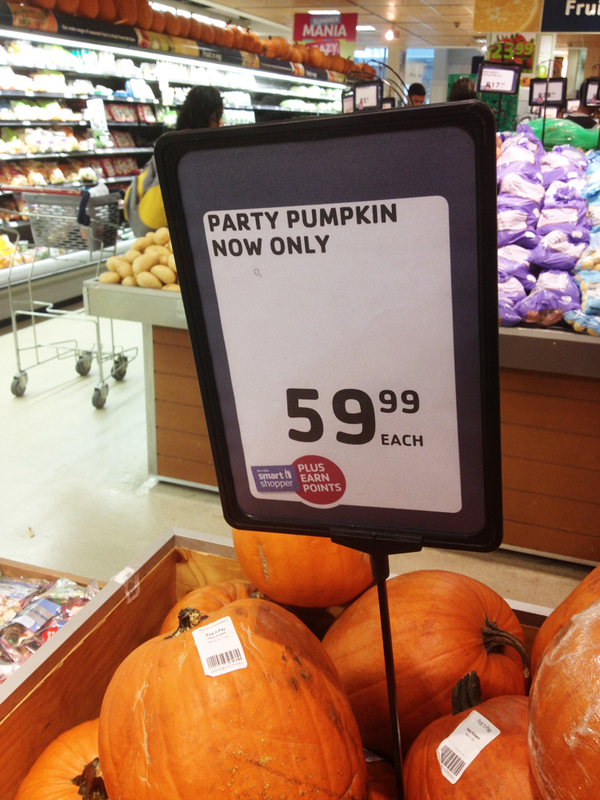 Nick spotted the “party pumpkins” (as they were labeled) at the supermarket last week. I’ve never seen them here before (granted, I’ve never looked) – usually the pumpkins are solid all the way through (really squash, perhaps?) But there they were, lining the shelves! It wasn’t quite the same as picking one out from the pumpkin patch, but nevermind. We invited Nick’s sister and her kids over mid-week to join in the fun, since it wouldn’t be the same without little ones around. 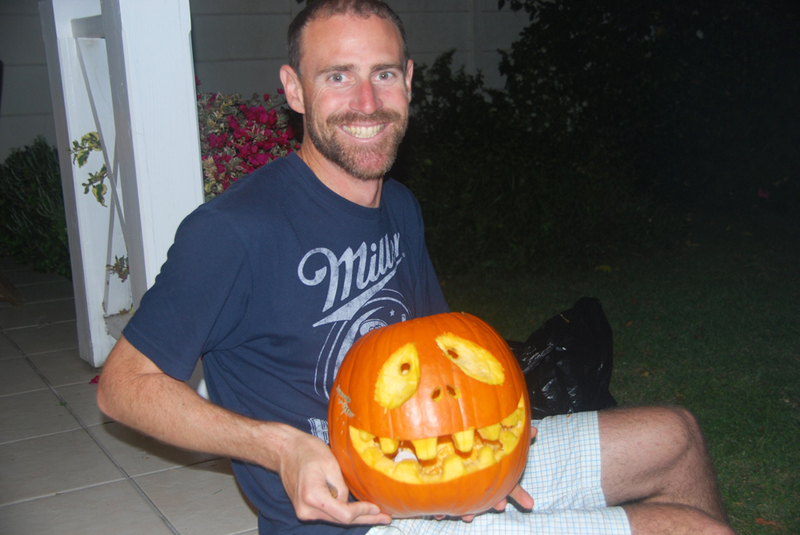 The day we picked happened to be the first real summer’s day we’ve had here in Cape Town yet – 80s, no wind, pretty much perfect weather, but it seemed odd to be carving pumpkins in Summer. 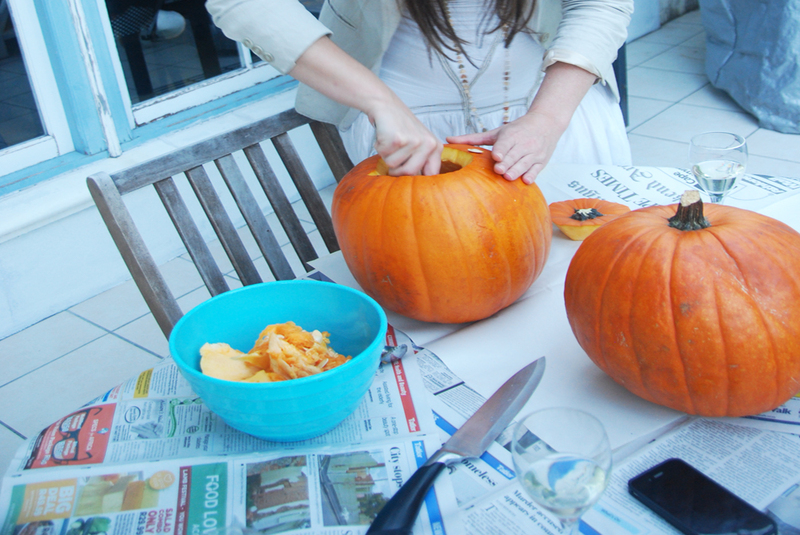 I got over it – it is much nicer to stick your hands in pumpkin goo when you aren’t freezing. I seem to have conveniently forgotten all the difficult and gross parts about the pumpkin carving process (ah, selective memory). Even though they’re hollow, there is a lot of “meat” in there that you have to clean out, and no easy way to do it. And pumpkins are thick. Which makes them VERY hard to cut, and we had absolutely the wrong tools for the carving job. It’s definitely not something little kiddos (or I) can do on their own – I think Nick had to cut the lids off all our pumpkins, and the adults did all the actual cutting. The part that I was most excited about (roasting pumpkin seeds, mmm) turned out to be a complete schlep – separating the seeds from the stringy goo is tough. We both collapsed at the end of the evening feeling exhausted. Despite all that, I think we had a blast. And seeing them all lit up was just as magical as I remembered it. Find a pumpkin. A critical first step. Pumpkins must be the hollow kind – beware pumpkin-shaped squash that are solid all the way through. If you get one of those, the best you can do is draw a face on them (trust me, I’ve tried to hollow them out and cut them, it 100% does not work). Prepare your workspace. Lay out some old newspapers on a table or the lawn – it isn’t so much about keeping the area you’re covering neat and tidy as it is about easy clean-up. You’re going to need someplace to dump all that pumpkin-goo you pull out in step 4. 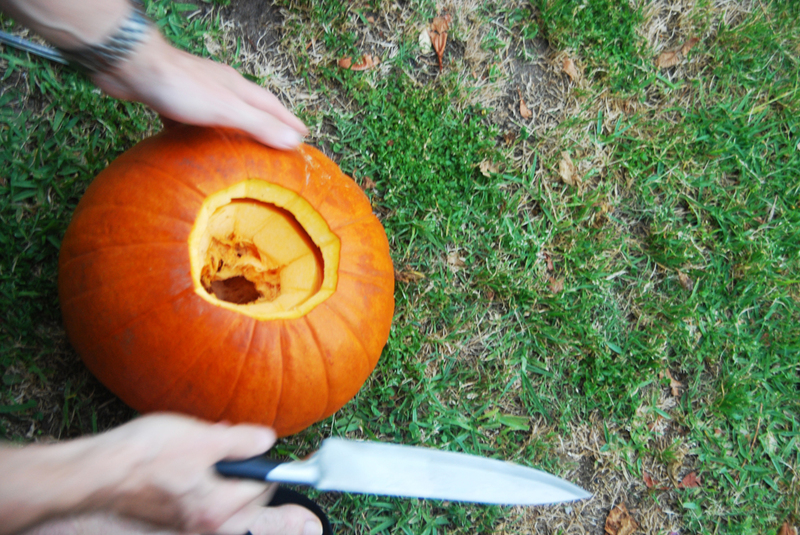 Cut the lid off your pumpkin. This is the step that every Dad out there dreads. Pumpkins are tough little buggers, and it takes some serious power to get the top off. You should make sure to cut the lid at an angle so that it doesn’t fall through when you put it back on later. Clean out the pumpkin. This is the gross part. If you’re like me and hate getting your hands dirty, use a metal spoon or ice cream scooper to get the stringy, goopy mess out. I wish I had this pumpkin gutter tool. Scrape the sides that you’re going to carve as much as you can – the more you can scoop out the thinner the walls will be. Decide on your design. This is the fun part (or the stressful part if you’re a competitive perfectionist, ahem, you know who I’m talking to!) Yes, we’ve all seen the insane designs on Pinterest created by people with too much time on their hands. Relax. You don’t need to go quite as nuts as all that, and besides, those people use special tools (dremels? really??) Keep it simple, especially for your first pumpkin. 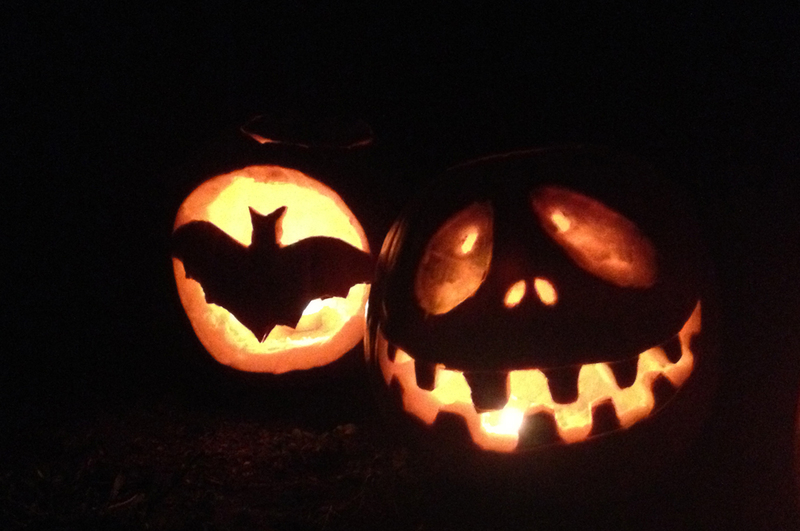 Curved lines are harder to cut, which is why standard jack-o-lanterns have triangle eyes, square teeth, etc. You can spend time drawing it out on paper, or just jump straight to the next step. 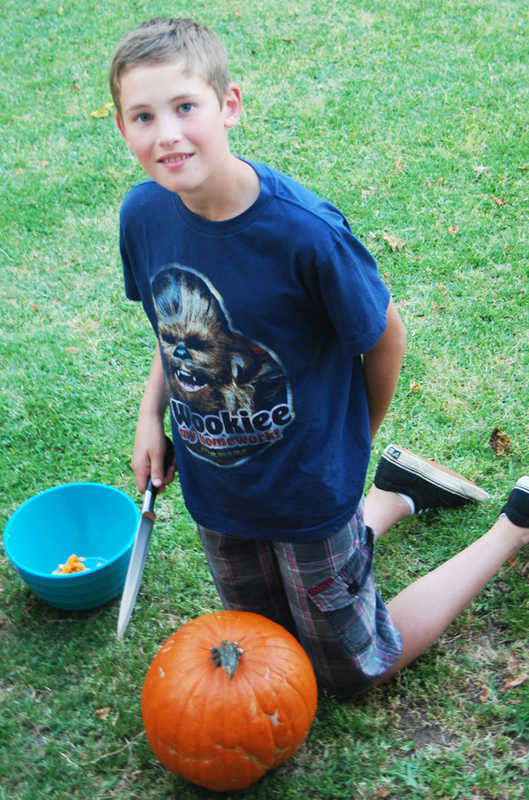 Transfer your design on to your pumpkin. 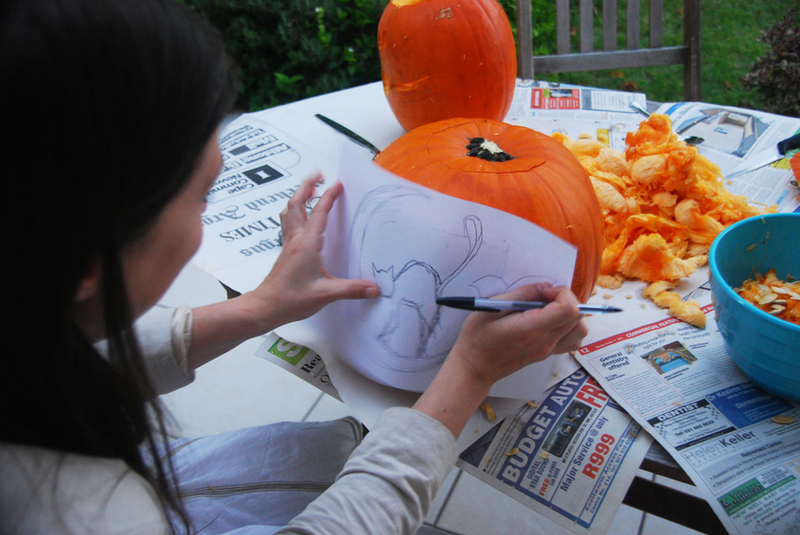 A pumpkin may be round-ish, but there is definitely a better side to carve on – find it. Draw out your design, keeping in mind which pieces you want to cut out and which you will leave intact. 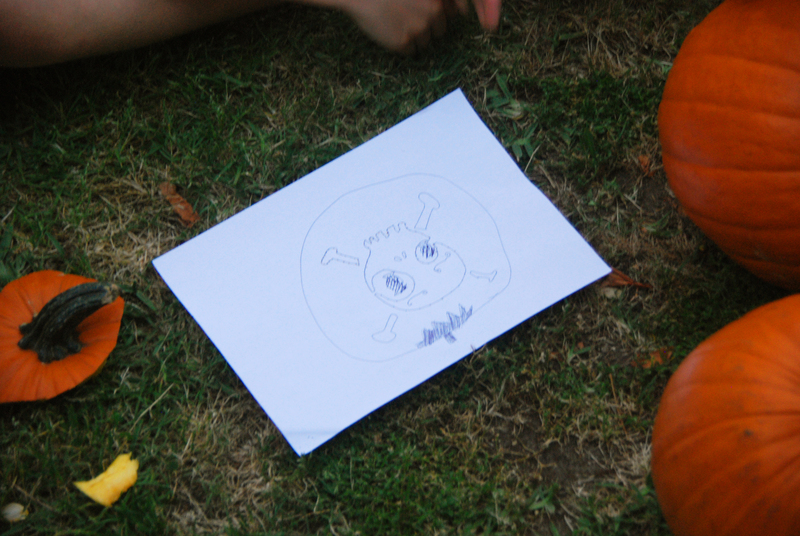 If you have a complex design, you can use what you drew on your paper and transfer it to your pumpkin using a push-pin. Carve! I lied – step 3 isn’t the hard part, this is. But it’s also fun. Make sure you have the right tools for the job. In the US they sell all sorts of kits with little safety knives for kids and fancy tools for intricate designs. In our (limited) experience where those don’t exist, we found that a short-handled, swiss army-type knife works best. 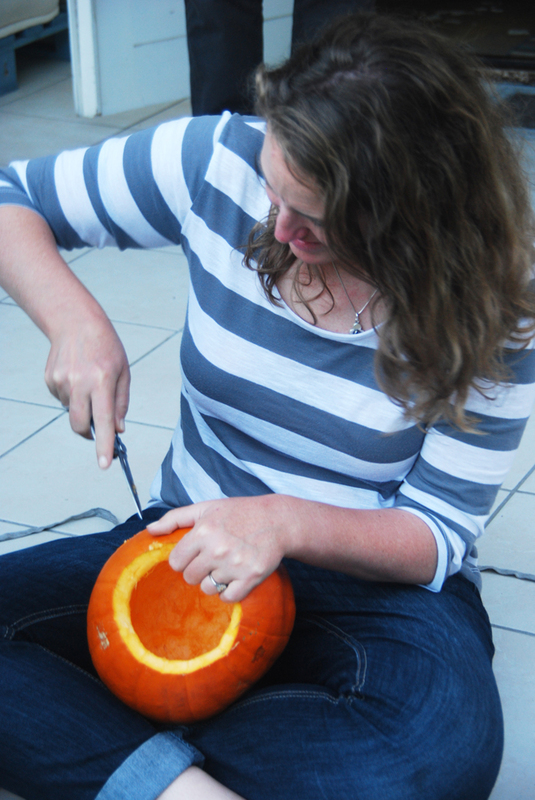 Serrated edges are a must to saw through the thick pumpkin. You can cut roughly and go back and clean up edges later. If you make a mistake and cut off a part you meant to leave on, you can re-attach (kind of) with toothpicks. Just be careful – fake blood and gore is part of Halloween, but real severed limbs shouldn’t be. Light and enjoy. Fairly self-explanatory – stick a tea light in, light it up, turn off the lights, step back and watch your creation glow. Magical. OPTIONAL EXTRA: Roast the pumpkin seeds (yum!) 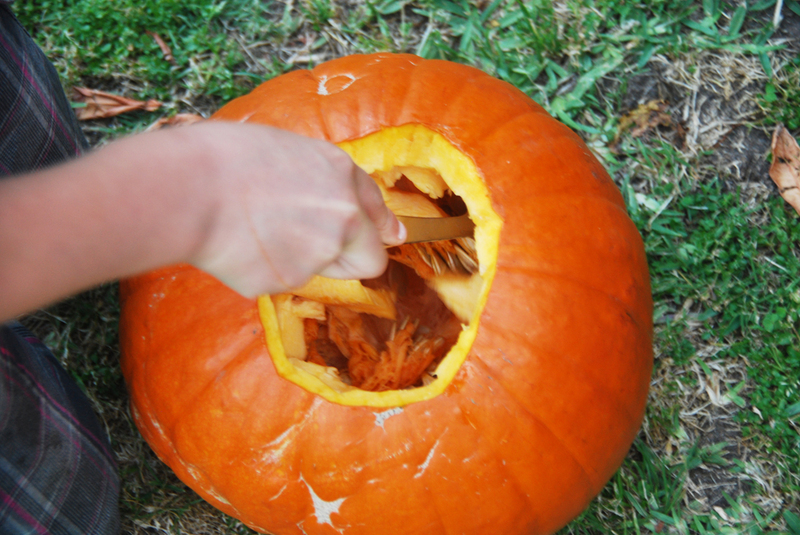 The easiest way to get the seeds off the stringy pumpkin guts is to do it right away as you’re pulling them out. Put them into a bowl, and when you’ve collected all you want, give them a thorough rinse in a colander and pick out any big pumpkin bits. Soak them in salt water overnight, and when drained coat them in a little butter or oil. Add any spices, sweet or salty, that you’d like. Lay them out in a single layer on a baking sheet and pop them in the oven at 120° C/250° F for about an hour, shaking/stirring every 10-15 minutes to make sure they’re evenly cooked. Eat. Yum. WARM WEATHER MUST: Preserve your pumpkin. Something I’ve never had to deal with in MN is how best to preserve a pumpkin once it’s carved. In fact, I’d never thought about it until Nick asked how to keep them from rotting before Halloween. From researching various sources, the consensus seems to be that bleach is the way to go. 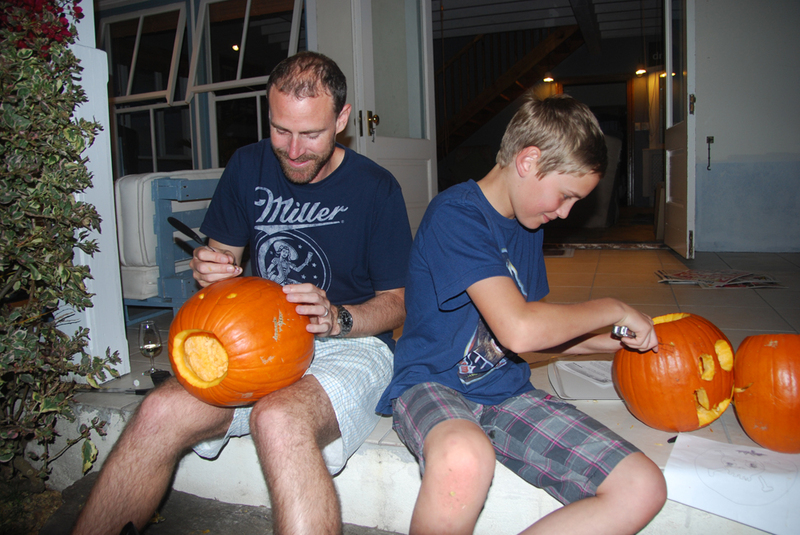 This entry was posted in Making Home, US 101 and tagged family, Halloween, holidays, tradition by jlgeib. Bookmark the permalink.